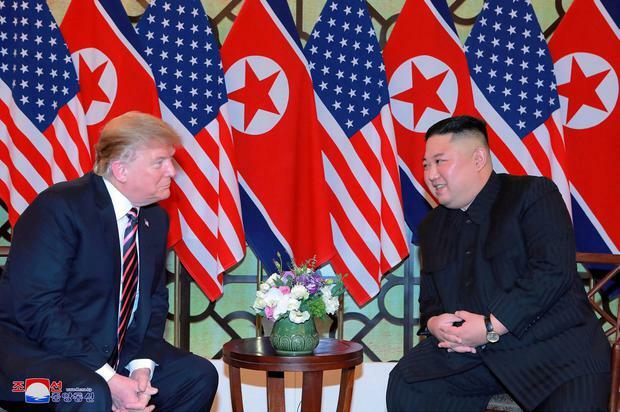 North Korean leader Kim Jong-un and US President Donald Trump met in Vietnam yesterday for a second summit which the United States hopes will persuade North Korea to give up its nuclear weapons in exchange for promises of peace and development. Mr Kim and Mr Trump shook hands and smiled briefly in front of a row of their national flags at the Metropole Hotel in the Vietnamese capital, Hanoi, before heading to dinner together. Mr Trump said he thought the talks would be very successful, and asked if he was "walking back" on denuclearisation, said "no". At their historic first summit in Singapore last June, Mr Trump and Mr Kim pledged to work toward denuclearisation and permanent peace on the Korean peninsula, but little progress has been made. Mr Kim said they had overcome obstacles to hold their second summit and praised Mr Trump for his "courageous decision" to begin a dialogue. "Now that we're meeting here again like this, I'm confident there will be an excellent outcome that everyone welcomes, and I'll do my best to make it happen," Mr Kim said. Mr Trump and Mr Kim held a 20-minute one-on-one chat before sitting down to dinner. Today, the two leaders will hold a series of meetings, the White House said. The venue has not been announced. Experts said the pair were at pains to show their relationship had improved since their first meeting. Mr Trump said late last year he and Mr Kim "fell in love", but whether the bonhomie can move them beyond summit pageantry to substantive progress on eliminating Pyongyang's nuclear arsenal which threatens the US is the question which will dominate talks. The Singapore summit, the first meeting between a sitting US president and North Korean leader, ended with great fanfare but little substance over how to dismantle North Korea's nuclear weapons and ballistic missiles. In the run-up to this summit, Mr Trump has indicated a more flexible stance, saying he was in no rush to secure North Korea's denuclearisation. Asked if he would declare a formal end to the Korean War, which North Korea has long called for, he said: "We'll see." He has also said he would be happy as long as North Korea, which has not tested a nuclear weapon or intercontinental ballistic missile since 2017, maintained that freeze. Evans Revere, a former US negotiator with North Korea, said Mr Trump was under pressure, given the criticism and other domestic problems, and Mr Kim might try to use that. "Kim may be tempted to push Trump even harder for concessions, knowing how much the president wants and needs that testing pause."